A thick column of black smoke rose from the facility, which supplies the territory with two-thirds of its energy needs, and the fuel containers were in flames. Al-Sharif added that the local fire brigade was not equipped to extinguish the blaze. 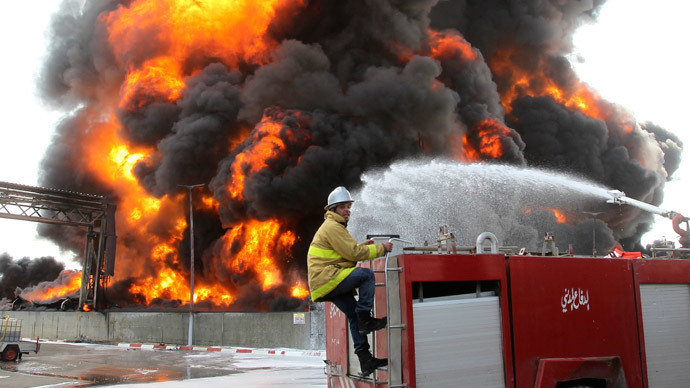 Gaza's power plant was forced to shut down after two tank shells hit one of three fuel tanks, said Jamal Dardasawi, a spokesman for Gaza's electricity distribution company. The shelling sparked a large fire and a huge column of smoke was seen rising from the site. Dardasawi said 15 workers were trapped inside by the fire and that the damage would take months to repair. There was no immediate word on casualties, AP reported. Even before the shutdown, Gaza residents only had electricity for about three hours a day because fighting had damaged power lines. The plant was also hit last week, which meant it was running at a reduced capacity of about 20 percent. Besides the power plant, Gaza also purchases electricity from Israel, but many of the supply lines have been badly damaged by the recent fighting, Sheikh Khalil said. "Five out of 10 of the Israeli electricity lines into the Gaza Strip were also damaged because of Israeli shelling, and maintenance still cannot reach the areas and fix them," he said. Lt. Col. Peter Lerner, an Israeli military spokesman, did not comment on the explosion at the plant, but told The Associated Press that Israel's latest strikes signal "a gradual increase in the pressure" on Hamas. The pounding came after Israeli Prime Minister Benjamin Netanyahu on Monday warned of a "prolonged" campaign against Hamas. Israeli aircraft also fired a missile at the house of Hamas’s Gaza leader Ismail Haniyeh and flattened it before dawn, causing damage but no casualties, Gaza's Interior Ministry said. "My house is not dearer than any of the houses of our people," Haniyeh was quoted as saying on a Hamas website. "The destruction of stones will not break our will and we will continue our resistance until we gain freedom." Israel launched its military offensive in Gaza on July 8, saying it wanted to halt rocket attacks by the dominant Hamas movement and other armed groups. Ten days later, it sent in ground forces with the declared aim of destroying Hamas tunnels that criss-cross the border area. Though international pressure has been mounting to end the fighting, there is no end in sight to the 22-day conflict in which 1,116 Palestinians, 75 percent of whom are civilians, and 53 Israeli soldiers have been reported killed.